Combine the almond flour, salt, baking soda, and cinnamon in a large bowl. In a smaller bowl, whisk eggs, vanilla, honey, and butter. Whisk until smooth. Stir wet ingredients into the dry. Combine. 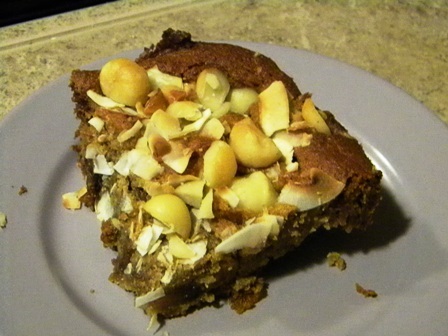 Top with chopped macadamia nuts. Bake for 30 – 35 minutes. Until bars are set – they will still be chewy, but the bars should be cooked through. Cut into bars and store in refrigerator. ok wow. i’ll take 3! I checked out your PInterest site. I guess I need to play around with it. It seems more visual than the blog format to organize info.